1. Remember that tomorrow is June 16th – Save The Bookstores Day. Did you read Tara Lazar’s great post about this: http://taralazar.wordpress.com/2012/06/04/support-save-the-bookstores-day-on-june-16th/. Unfortunately, I have to work on Saturday, but on Sunday, I’ll be at one of the Indie bookstores here in Colorado Springs, Poor Richards. They are one of the local bookstores that has copies of Show Me How for sale…if you haven’t seen the amazing review Kirsten did, please click over to her blog, Creating Curious Kids. Keeping children occupied with fun-filled educational self-esteem building activities is a wonderful way to spend the summer! Do you know some parents who would appreciate a book that provides hundreds of quick and easy activities that use stuff they probably have around the house? Please keep Show Me How in mind. 2. Sunday is a very special day as well…June 17th is Father’s Day! There are so many wonderful fathers and father figures out there…this day is for all of you! I have to make a special shout-out to my son-in-law who is an amazing hands-on dad…not only does he play ball and take walks with his son, he also never misses being part of the daily bedtime routine, reading stories and overseeing the brushing of teeth. When my daughter has to travel for business, Erik never falters and is mom and dad at those times. I’m also very proud of my son who has twins who are almost seven. From the time they were born, he has shared in EVERY moment…feeding, changing diapers, singing them to sleep…now they all ice-skate and play chess together. My pick for Perfect Picture Book Friday is in honor of those dads who really step up to the plate. When five-year old Charlotte’s mother dies in a car accident, the little girl has many feelings she is not comfortable expressing to her dad, even though she loves him very much. She worries about going to sleep because an aunt told her that dying was like going to sleep. She is angry and sad and scared, although on the outside, she still looks the same. After an incident at school alerts her father to the fact that Charlotte is not dealing well with the death of her mother, he decides to go with Charlotte to see a therapist. The therapist helps them to talk about how they feel and they realize that although they will continue to feel sad about the death of Charlotte’s mother, they can find happiness in life. Memories of special people, places and experiences are extremely important for all of us. Help your child start a box of treasured mementos now! 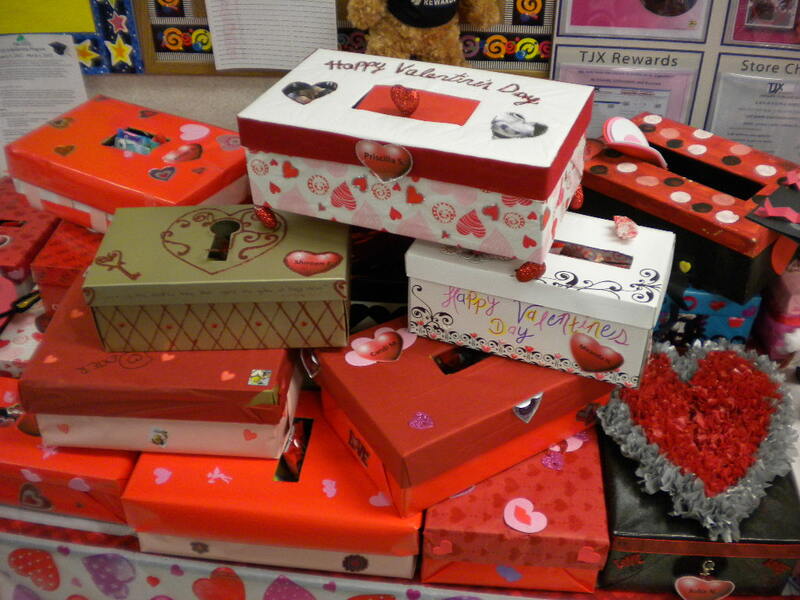 The boxes in the pictures below were actually made as Valentine’s Day mailboxes by the people I work with, so each of these boxes has a slit for Valentine’s Day cards to be inserted into…your child’s treasure box won’t have the slit. I was so impressed with the effort and creativity of these adults, I wanted to share some of the boxes with all of you. You will need: One shoe box with lid, paper to cover the box (construction paper, gift wrap, shelf paper), scissors, and glue or tape. 1. Cut the paper your child has selected to cover the box. You will need two pieces, one for the box and one for the lid. Important tip: if you use painting paper, your child can decorate it with vegetable prints, sponge painting or pictures cut from magazines or greeting cards. 2. Carefully fit the paper around the outside of the shoebox and glue or tape in place. Do the same with the lid. 3. 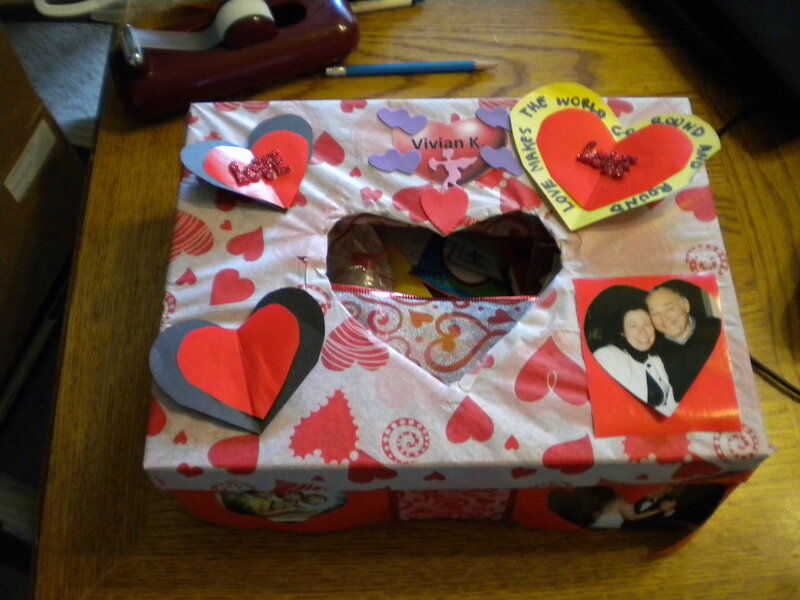 Make a label to put on the box, for example: EMILY’S TREASURED MEMENTOS or JOSH’S BOX OF MEMORIES. My box had pictures of my family, all around the sides. That might be a nice idea for a child using pictures of family and friends. Some more treasure chest ideas here. Great website to help kids dealing with death at kidshealth.org. Some helpful tips for talking with children about the death of a parent at FamilyHealth.com. This entry was posted in children's picture books, Crafting with Children, Father's Day, Kirsten Larson: Creating Curious Kids, Perfect Picture Book Friday, Poor Richards Bookstore, Reading with Children, Save The Bookstores Day, Show Me How! and tagged Cornelia Spelman, Death, Father's Day, Perfect Picture Book Friday, Picture book, Susannah Leonard Hill by viviankirkfield. Bookmark the permalink. An excellent sounding book on a difficult, but vital topic. Thank you, Vivian! Oh, Vivian, I’m always looking for good grief/loss resources for my counseling with children. Thanks for the lead on Charlotte’s story! I’ve found that books have such a healing effect on kids who are traveling through the hurt of losing someone special. Not sure if I already answered your comment, Barbara. :) So glad the book will be helpful…I appreciate your kind words! I love that this book addresses the topic of the loss of a parent directly. It must be very comforting for children dealing with this impossible situation to have a book that helps them cope. Thank you, Vivian, for this wonderful resource. Again, I feel so lucky to have your blog as a resource. And congrats to raising wonderful children who have become or married men who are wonderful dads. I will be visiting my son in Chicago in two weeks…really looking forward to that! Sounds like a sensitive grief book. Haven’t seen this one before. And, I’m always looking. Beautiful resource. Will have to check it out. Hi Pat…so glad I could provide another resource for you…I am in awe of all of the amazing books you review on so many difficult topics. Just love the idea of the treasure box! I am always impressed with writers who can address difficult issues with grace. This sounds like a wonderful book. Thanks, Vivian! Love the treasure box idea. Sounds like this is real and sensitive about a difficult topic. Wonderful resources, especially the idea for the treasure box. I like that the book points out the well intentioned mistake that adults can make by telling children death is like sleep. It sounds like a lovely, gentle book on a difficult topic. I know, Heather…how scary is that to be told that death is like sleep…makes a kid NEVER want to go to bed! It is a sweet book…and I especially love the way it shows how the father was able to open up and express his sadness as well. Thank you, Vivian. With children, books are often a wonderful and softer way of dealing with hard topics. I already feel sad for Charlotte. 😦 I should get this book. It has an important message! Thanks, Robyn…glad you like the PPBF pick and the activity. I’ll be excited to hear more about your book..this is a subject that doesn’t have many books for little ones…the baby bird sounds like a great main character!